Alyssa Park established an enviable international reputation at age sixteen for being the youngest prizewinner in the history of the Tchaikovsky International Competition. She has made numerous recital and orchestral appearances in this country since her professional debut at age eleven with the Cincinnati Chamber Orchestra. Her New York City debut recital at Lincoln Center’s Alice Tully Hall was critically acclaimed by The New York Times for “an unusually strong technique and a youthful sense of music making.” Other notable credits include the Ravinia Festival Series, Kennedy Center Recital Series, Oregon Bach Festival, and Rockefeller University in New YorkCity. Ms. Park performs extensively every season throughout Europe. She has performed with Sir Colin Davis and the Bavarian Radio Symphony Orchestra as well as appearances with the Lausanne Chamber Orchestra, Stuttgart Chamber Orchestra, and the Czech Philharmonic. Her performance with the Austrian Radio Symphony at Vienna’s Musikverein was featured in a live radio and television broadcast throughout Europe. She toured Germany with the Bamberg Symphony orchestra, the Czech Philharmonic,the Barcelona Orchestra, Mitteldeutsche Rundfunk at the Leipzig Gewandhaus, the Hamburg Philharmonic, and to Spain, Switzerland, and Austria with the Cincinnati Symphony and appeared as soloist with the orchestras of Sydney, Adelaide, and Tasmania, Australia. Ms. Park’s recent seasons included performances in Asia with the Korean Broadcasting Symphony, Japan Philharmonic, and the Singapore Symphony. She was also featured with the Berlin Radio Orchestra, Frankfurt Radio Orchestra, Lisbon Symphony, Salzburger Kammerphilharmonie, Munich Philharmonic and made her debut at Italy’s Ravello Festival and Holland’s Royal Concertgebouw. 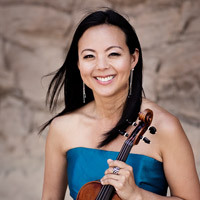 An avid chamber musician as well, Ms. Park has been a frequent guest at major festivals including Ludwisburg, Schleswig-Holstein,Weilburg, Passau, Frankfurt, Montpellier, France, Brahms festival in Madrid, Beethoven Festival in Bonn, Prague Summer Festival, and Oregon Festival of American Music. She is a founding member of the Lyris Quartet which is based in Los Angeles. Lyris curates the “Hear Now” new music festival which is dedicated to performing the works of living Southern California composers. The quartet is also the resident quartet for the the highly acclaimed Jacaranda music series in Santa Monica. Lyris has collaborated closely with composers Krystof Penderecki, Andrew Norman, Oliver Knussen, Steven Mackey, John Adams, Bruce Broughton, Peter Knell, Kurt Rohde, Paquito D’Rivera, Wadada Leo Smith, and Gerard Schurmann. This year they performed as part of the Los Angeles Philharmonic’s Green Umbrella series and will also be featured at the Hollywood Bowl this fall.